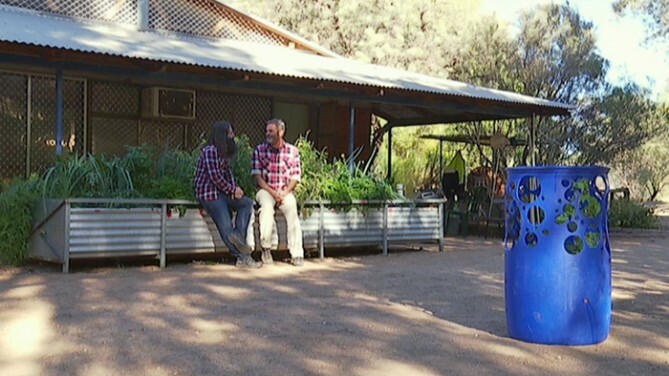 Gardening Australia did a video, well worth watching, of David de Vries’ self watering containers that he builds for the Red Cross in Alice Springs. De Vries has devised a simple and efficient way to turn drums into gardens. They look good too. We’ve featured self watering containers on our blog and in our books. They are a great way to deal with hot climates and bad soil. And, in many places, drums are as plentiful as people. Thanks to Helen in Sunbury, Victoria for the tip! 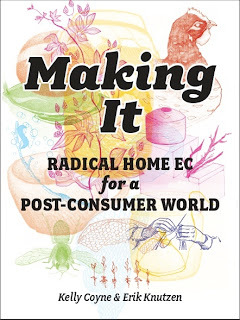 We’ll get back to our thoughts on responses to the Three Headed Hydra of Doom tomorrow, but for today we’re going to take a quick break for a practical post: Self-Irrigating Strawberries! This spring I built a self-irrigating gutter (SIG) using two gutters based on a video by Larry Hall. You can see my original post about this project here. Essentially, it is a gutter filled with potting mix, sitting on top of another gutter filled with water. Every eight inches there is a 3 inch perforated pot filled with potting mix that hangs down into the water filled gutter. For mulch I used re-purposed billboard vinyl scavenged from a dumpster by my neighbor Ray. The SIG works, but there have been a few problems. My strawberries, I believe, have a fungal disease called red stele (Phytophthora fragariae) which came either from the soil that came with the starts or from the planting mix I used. If I want to grow strawberries again I’m going to have to thoroughly disinfect the gutters. The SIG is hooked up to a 55 gallon rain barrel. Unfortunately the lower gutter leaked around 50 gallons of stored rainwater down into the garage below (our house is on a hill and the garage is at street level). To prevent this problem in the future I put a manual irrigation timer on the barrel so that if there is a leak, I won’t lose all the water at once. If I were to do this project again, I’d also use a refinement that Larry Hall just posted in the video above. This improvement on the design replaces the lower gutter with a 4-inch drain pipe. The drain pipe is easier to keep water-tight. And instead of using a gutter filled with soil I might use a series of pots (an idea that’s also in the video)–gutters are too shallow for most plants. Despite the problems, I would call the project a success. In fact, I may expand my gutter system out onto the rest of the garage roo. 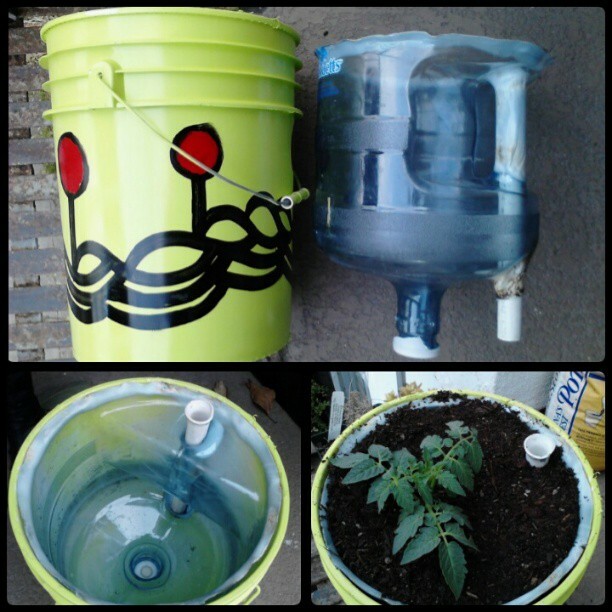 Federico Tbn sent me some very cool pictures of two self irrigating pots (SIPs) he built out of found materials. This one is a variation on the 5 gallon bucket system. The handle on the jug was a convenient way of inserting a piece of 1/2 inch PVC pipe to refill the reservoir. The plastic on the 5 gallon jug was surprisingly pliable; I was able to mold the top edge to fit the 5 gallon bucket better by carefully heating it with a propane torch. The art is just for fun, sometimes it is hard for me to leave things unpainted. 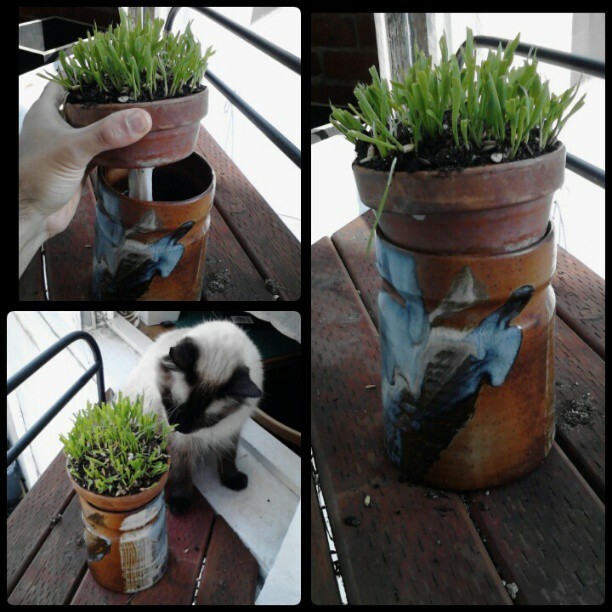 The second pot uses a sock to wick water up into a container full of cat grass. Kitty looks happy. 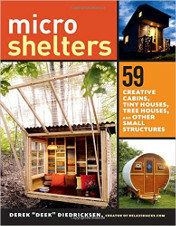 I’ve used SIPs for years and they are a great tool for landless gardeners. Federico has taken the SIP a step further by making them beautiful. You can see more of Federico’s projects and art at eeio.blogspot.com. 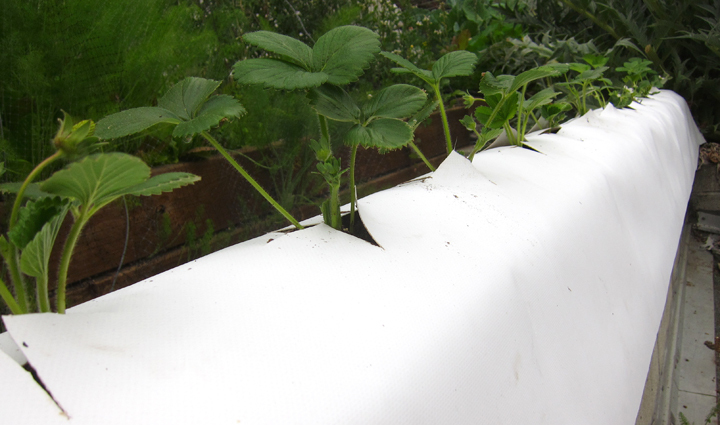 Growing Strawberries in a Self Irrigating Gutter (SIG). With some scrap wood I made a support system for the two gutters–one gutter holds water and the other holds soil. I sealed the ends of the two gutters with silicon putty and secured the gutters to the wooden support with screws. Next came my first trip to a hydroponics shop (there’s one on every corner in Los Angeles), to get a float valve. 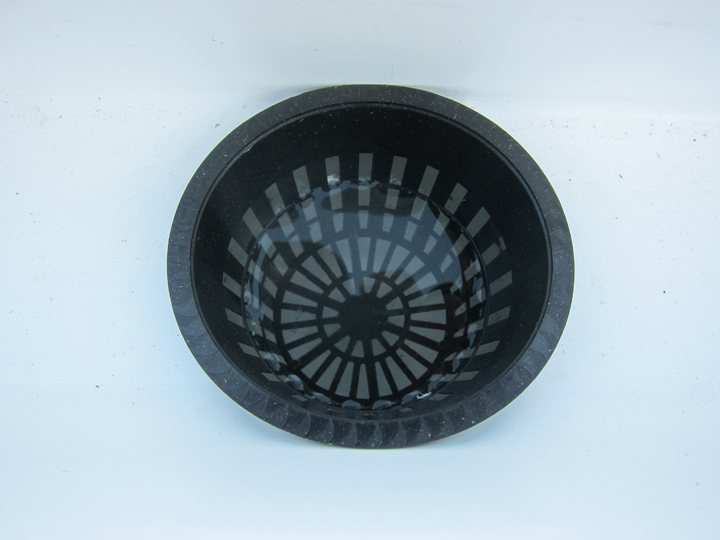 The float valve, similar to the one in your toilet, automatically fills the lower gutter with water as needed. I tried to fit the float valve through the end of the gutter but this kind of DIY bulkhead fitting is difficult to pull off. I ended up mounting the float valve above the gutter with a pipe strap, as you can see in the photo above. I cut the upper gutter around 10 inches shorter than the lower one so that I could access and maintain the float valve. The second item I picked up at the hydroponics shop was a bunch of 3 inch mesh pots. These hang down into the lower gutter and wick water up into the soil. I cut circular holes in the upper gutter using a hole saw, and fit the mesh cups into the holes. Next I filled the upper gutter with potting mix (note that with self watering containers you have to use potting mix, not regular soil). And all self watering containers need mulch of some kind–I just happened to have a roll of vinyl billboard material that my neighbor Ray gave me. I stapled the vinyl to the wooden gutter support and stretched it over the top of the soil. I cut holes and planted my strawberries about 8 inches apart. Rain barrel. The white pipe on the left is an overflow pipe that drains to the street. 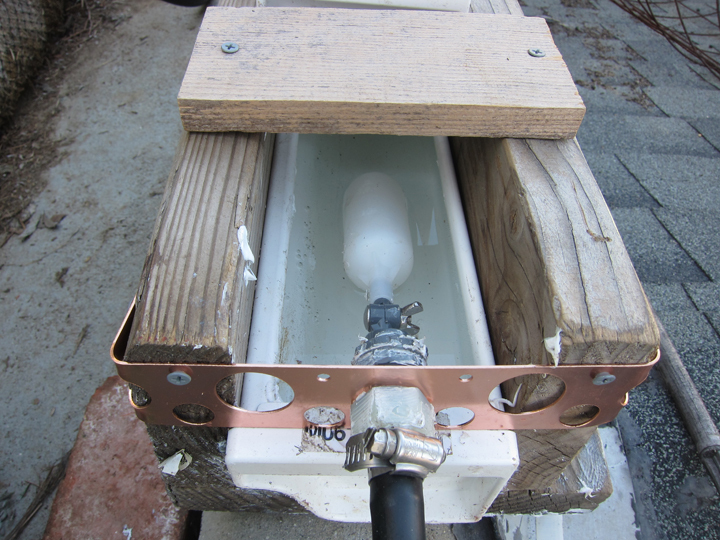 The float valve is connected to a rainwater barrel. You can read more about how this barrel is constructed in one of our older posts. 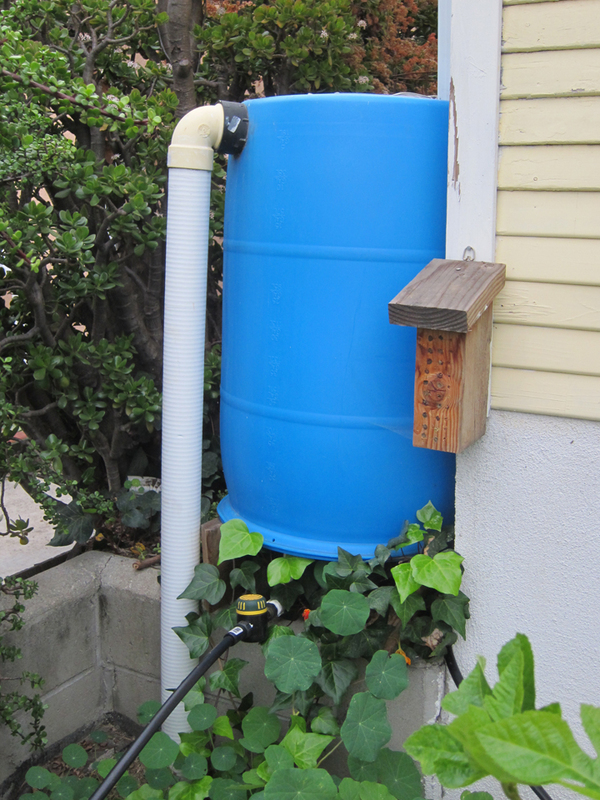 Since SIGs need to be watered even when it’s raining, this is a perfect use for a rain barrel. I will have to fill the barrel with municipal water during our dry season. There’s a lot of plastic here, specifically PVC, which is an environmental and health disaster. I have two questions–how much PVC is leached into the growing medium and how much of it would be taken up into the fruit? I don’t have an answer to either. 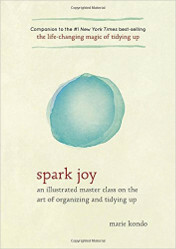 If you know of science-based information (i.e. not Livestrong articles) on PVC and growing food please leave a link. Generally, plants do not take up toxins into fruit so I’m not losing any sleep thinking about eating a few strawberries grown in my small PVC SIG. I might think twice about eating greens grown in PVC. The other issue is the use of peat moss as the growing medium. Peat moss is unsustainably harvested (see Horticulture professor Linda Chalker-Scott’s article on this). Coconut coir, in my experience works great, but not in self watering containers. 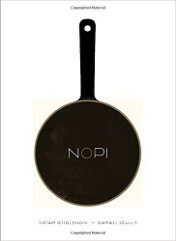 If you know of a peat moss alternative for self-watering containers, please comment. There might also be mosquito problems with the standing water in the lower gutter. This could be countered with a mosquito dunk. I can now grow food in an otherwise useless space–the top retaining wall in our front yard (we live on a hill). I can also, finally, make good use of my rain barrel. I was also able to recycle a bunch of scrap wood and some billboard material. And, unlike hydroponics, no electricity or liquid fertilizers are needed. If this system works out I’m eying the top of our garage for more SIGs (our garage is at street level below the house–we look down on it from our front porch). I think there’s also an opportunity for an entrepreneur to make a non-PVC version this gadget out of food grade material such as HDPE. With a custom design you could also enlarge the upper, soil container gutter as well as creating a sealed mosquito proof lower container. But you would have to sort out who owns the patent on self-watering containers. And many thanks to Larry Hall for sharing this cool idea! 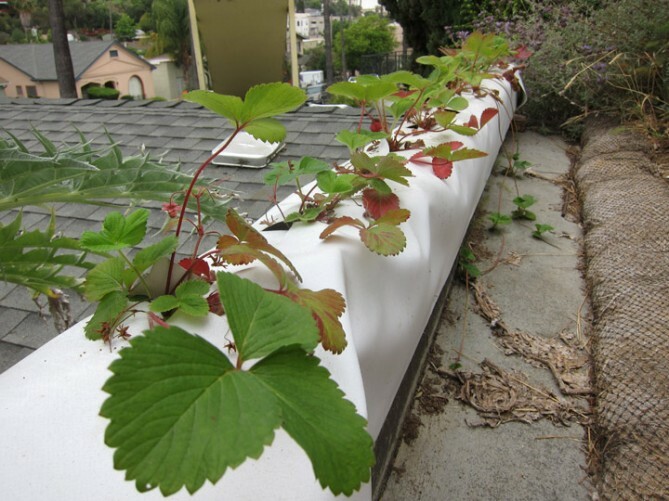 UPDATE 4/30/2013: One side of the strawberry gutter sprung a leak due to a poor seal on the end of the gutter. I was able to fix it. One thought about the design is that you should leave both ends open and the gutter ends accessible so that you can make repairs. And make sure to use a sealant appropriate for gutters. 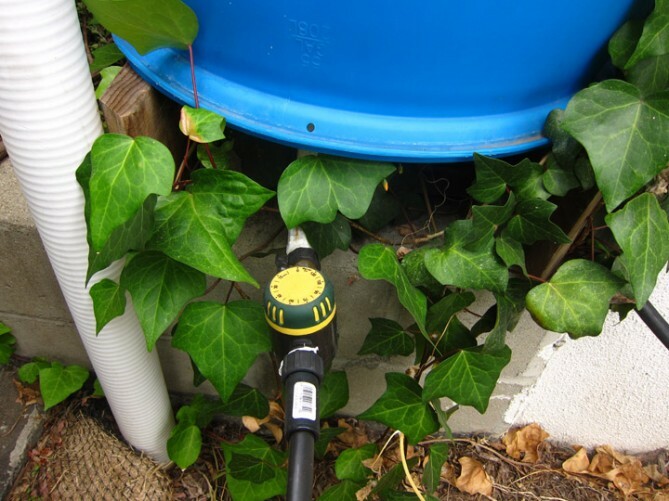 A very cool improvement on the self irrigating pot (SIP) idea from Larry Hall of Minnesota. Rather than the two bucket system we’ve blogged about in the past (see a roundup of our SIP resources here), Hall uses one long rain gutter to supply water. He’s even got a clever double rain gutter system for growing strawberries that I’m tempted to try on our back patio. I spotted this video on Inside Urban Green always a good source for SIP related news.